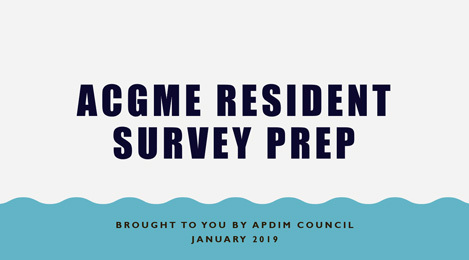 The ACGME Resident Survey is an annual survey required as one of several tools used by the Review Committee (RC) to monitor programs for accreditation. The 2017 APDIM Spring Survey identified stress and pressure on program directors attributable to the annual resident survey. The stress is related to the implications of the survey for accreditation, vague and confusing language for trainees, and the pressure to make changes in their program to improve the survey. We share answers to program directors' frequently asked questions (FAQs). This document has been reviewed by the RC-IM for accuracy. Please also see the RC-IM website for more information as ACGME resources on resident/fellow and faculty surveys. What are implications of an unfavorable survey? The intent of the survey is to provide resident feedback to you and the RC about your program. The resident survey is only one of several tools the RC uses for annual program review. It is an important instrument, but ACGME is aware of its limitations. RC first considers if the “flags” are real. They look to see which data elements are flagged, how many data elements are flagged, and if trends exist over time. Small programs with limited respondents are at risk of higher non-compliance rates (for example, two residents in a program with only four total may have a 50% non-compliance rate). RC-IM takes this into account when they review the program. Does an unfavorable survey mean I will have a citation? Most programs in NAS do not have any citations. Based on 2016-2017 academic year’s annual review, only 5% of all 2,200 internal medicine programs (core and subspecialties) had a citation. For some perspective and comparison, in the last year of the old-accreditation system (that is, before July 1, 2013), approximately 80% of all internal medicine programs had at least one citation. It is also worth noting that fewer than 4% of core programs had a citation related to "service," and those include citations related to patient cap violations, seeing non-teaching patients, too much ICU or night float, and inadequate ancillary staff. How do I respond to an unfavorable survey? Have an open and honest conversation with your residents to learn reasons for the concerns. Decide internally if changes should be made or not (see below). Use the ACGME Accreditation Data System (ADS) to address concerns raised on your survey. Use the “major changes and other updates” section (under Program tab) to explain or comment on areas on the survey of concern to you. Entering even a few sentences in this space assures the RC that the program and institutional leadership have seen and reviewed the survey results and are working to make improvements. Do I need to adjust my curriculum to make my survey more positive? The intent of ACGME is for PDs to review the survey for formative feedback about their program and identify possible areas for improvement. The survey may inform areas in the program to improve, at the discretion of the PEC and PD. Programs should not feel compelled to alter curricular content or rotations due to “popularity” by the residents. For example, if residents do not like a particular rotation but the PEC considers it core to their training, a negative survey should not override curricular goals. The survey results should not be perceived as punitive. What can I tell my residents about the survey? ACGME encourages PDs to provide their residents with information about the survey and its questions. You are allowed to be a translator for the survey definitions and terms. This is especially important for the confusing language for some elements of common program requirements, such as “service vs education” (see below). Residents should be encouraged to answer the survey honestly and to clarify questions they do not understand. APDIM is in the process of creating a toolkit to share with your residents to explain and clarify the language of ACGME. The toolkit will be uploaded to this site when completed. What does the question "service vs education" mean? ACGME defines service as “non-physician obligations.” ACGME is changing the wording of “service” to “non-physician obligations” which should alleviate much stress. Non-physician obligations are those duties which in most institutions are performed by nursing and allied health professionals, transport services or clerical staff. Examples of such obligations include transport of patients from the wards or units for procedures elsewhere in the hospital, routine blood drawing for lab tests, routine monitoring of patients when off the ward and clerical duties such as scheduling tests and appointments. It is understood that while residents, like non-resident physicians, may be expected to do any of these things on occasion, these should not be performed routinely by residents and must be kept to a minimum to optimize resident education. Education includes providing care for patients, in addition to didactic and small group teaching sessions. Thus, when informing your residents about the survey questions, be sure to define this confusing question.